Those of us who have lived in this area for a long time know all about the high levels of mercury and other dangerous minerals in our water. Things are especially bad in the Dayton Valley, because for half a century the mines of the Comstock Lode were in operation, pulling up heavy minerals from underground and depositing them on the surface, where they could easily flow downhill whenever it rained and right into the Carson River. And as if there wasn’t enough nasty stuff in the area naturally, the miners imported mercury from elsewhere and used it to process the ores. This, too, seeped into the ground and made its way into the watershed. The result is toxic dirt over much of the area. Now, not everybody knows about this, especially newcomers, so it’s good to remind them every once in a while. So the Nevada State Health Division has released an advisory this week, informing anglers not to eat fish from the Carson River, particularly those caught downstream from Dayton. That includes the Lahontan Reservoir. 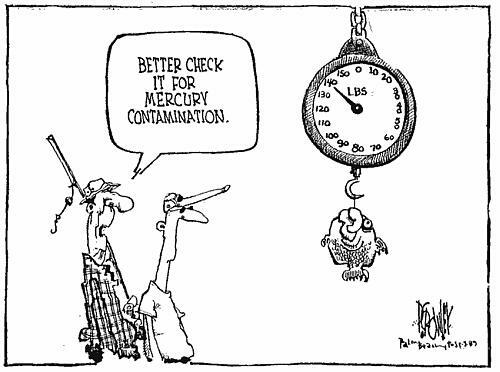 Recent testing has revealed fish in our waters that exceed federal limits for the amount of mercury contained in them; one specimen had eight times the recommended levels! So if you find yourself fishing in the Carson River this summer, especially in Dayton or Lahontan, I think it’s time for catch and release.